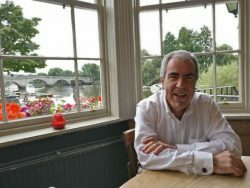 Paul Velluet, who is President of the Richmond Local History Society, is an architect, local historian and a former Chairman of the Richmond Society who continues to lead its highly successful annual summer season of Heritage Walks. Paul last spoke to our Society in 2015, on the 600th anniversary of the foundation of the Shene Charterhouse and we are delighted that he has agreed to return to tell us about St Mary Magadalene’s in this, its 800th year. Paul will be talking about Richmond’s historic parish church over the last eight centuries, spanning from its modest origins to its place at the heart of the town today. The talk will also update us on the current project of works at the church. ** Free admission to member of the Richmond Local History Society, Non-members are welcome and will be invited to pay £4 on the door. ***Please note that this talk will be at St Mary Magdalene’s Church and NOT at our usual venue, Duke Street Church. This entry was posted on 13 January 2020 by Robert Smith. RICHMOND LOCAL HISTORY SOCIETY explores the history of Richmond, Kew, Petersham and Ham. We organise talks, publish books and an annual journal, and organise visits to places of historic interest. Join us for free admission to our talks, an informative newsletter three times a year and discounts on our publications.